Take a breath of fresh air, admire the view, let go and marvel at the world below! Treat your loved ones with a tandem paragliding flight above the Salève with views of Mont Blanc and the Alps, Geneva and Lake Geneva! The classic afternoon flight around the Saleve. 30 minutes* of flight time to learn about the site and how we fly it. Even more! 40 minutes for the first real experience! * without a motor, we are unable to fully guarantee exact times for take off, landing, and time in the air. Thanks to an extensive knowledge of the site, we maintain the duration of flight times indicated to the best of our abilities, but cannot guarantee exact times. A warm reception, some of the most experienced pilots in the region with an exceptional professionalism and teachers with impeccable attention to detail.. 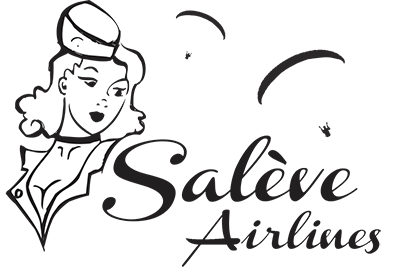 The Saleve Airlines team will stay by your side throughout your time with us, to make sure you enjoy and get the maximum benefit from the conditions and time available to you. I had a truly great time here! The staff is wonderful, and the paragliding was amazing! The staff was very attentive of its guests, and the view was breathtaking. Fantastic team of professionals. Wouldn't hesitate to recommend them to anyone wanting to try out this great sport.